Last year I experimented with my raised bed tomatoes. 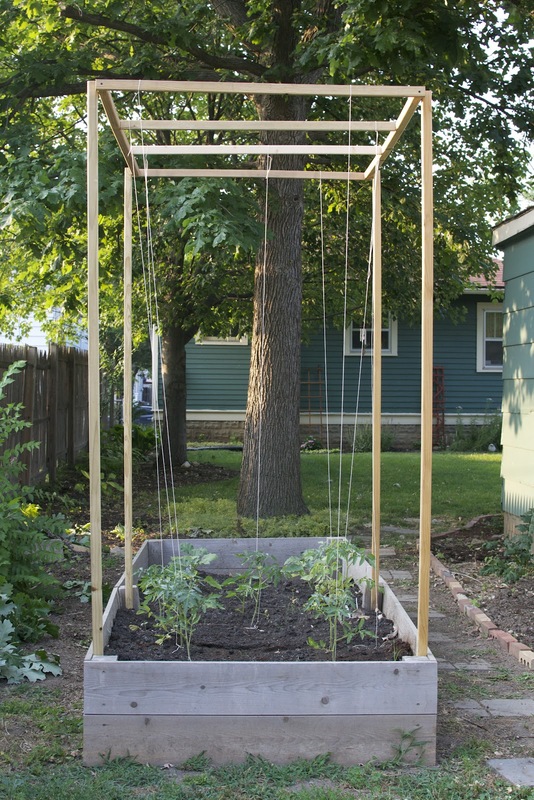 I saw the idea on a gardening blog to use strings to trellis your tomatoes as opposed to the oh so lovely tomato cages. Now, before you go and think that I'm too good for tomato cages, let me explain my reasoning. 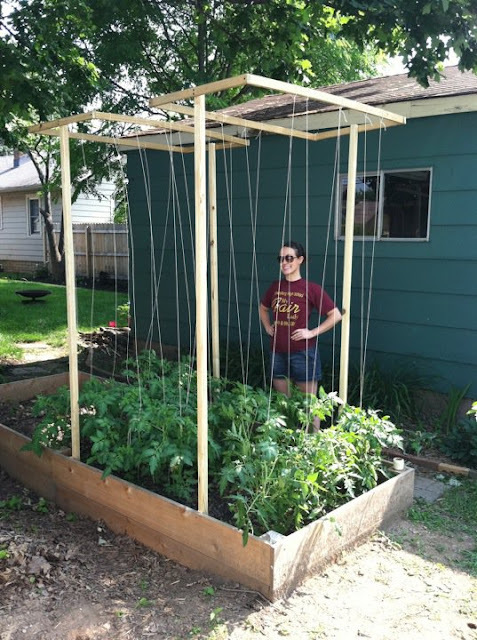 The first year I used tomato cages, my tomatoes got so high and heavy that I ended up having to stake the cage itself and then string the tomato branches to the stake so they wouldn't topple over. Time consuming and not effective. Also, with the raised bed, space is at a minimum, and I knew I couldn't fit all the cages. So the plot was hatched to use the trellis/string system. And fortunately, it's easy on the eyes as well. The picture below is me from last year in front of our new system. You can tell by the gleeful smile on my face that I have no idea what lies ahead for me and my beloved tomatoes. 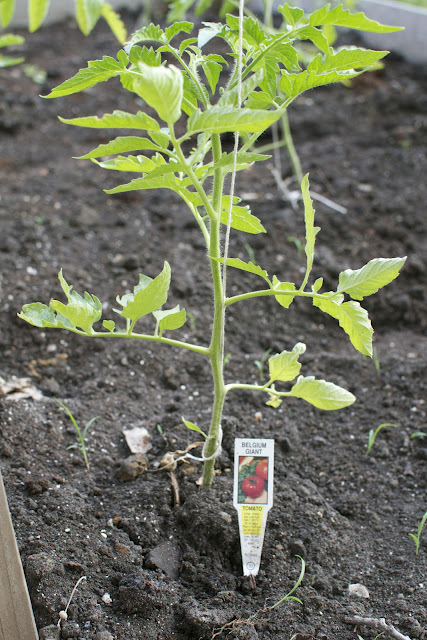 First, I ignorantly planted WAY too many tomatoes in that small space. They seem so tiny when they are seedlings, but if I had followed directions, I would have adhered to the 24-36 inches recommendation. When my Dad stopped by to see my new trellis, he kindly pointed out that there was no way I would get good tomatoes when them growing that close together. He suggested I pull a few plants out then and there, but being the all-knowing daughter that I am, I refused. Ugh, he was right. Second, my dirt was awful. You can tell from the picture that I barely filled the bed up half way, and even then a good majority of it was dead leaves that I figured would compost and help. Wrong again. With the past in the past, I was determined to do better this year. Here's how the trellising (sp?) looks this year. Much better. I really do love the system. As the plant grow, every week or so you simply guide the plant up the string. The important thing to remember is when tying the string to the base of your plant, be sure you leave enough room for the stem to grow (width-wise). It's a little hard to tell from this picture, but I tied the string so it's double/triple the width of the plant as is. This weekend I have a lot more work to do in the yard, so hopefully I'll have some pictures of the rest of my yard to share to soon. This is brilliant. In Georgia I need to cover the tomatoes mid-June to shade them a bit and keep out bugs that transmit disease. This is trellis and frame for a cover! I'm a noob (newbie) at a lot of things. I'm a new lawyer, new(ish) wife, new gardener, and now new blogger.